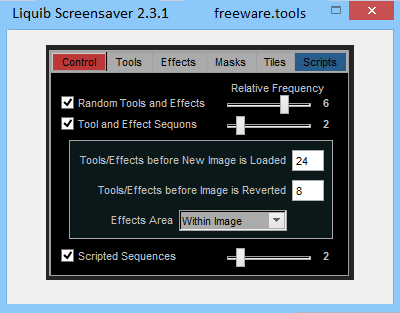 The Screensaver version of Liquib is a freeware tool that operates much like the Automatic Effects feature of the interactive Liquib, generating continuously evolving, often unique image transformations, optionally accompanied by your choice of music. Liquib Screensaver Configuration The Liquib Configuration screen provides options to control the characteristics of screensaver sessions. The source of images that effects are based upon can be set to an Image Directory or the Image Gallery, which is a collection of image files that can be displayed with a specified sequence and frequency. Liquib Screensaver performance can consist of any mixture of Random Tools and Effects. Screensavers are a popular means of customizing your desktop. They range from simple animations, like balls or bubbles bouncing against the borders of the screen to more complex ones. However, most of these tend to get a bit boring after a while. Liquib Screensaver attempts to avoid this by providing users with both a wide range of settings to tweak or fiddle with, and a fascinating ever-changing animated display that can create beautiful patterns and symmetries. The application's preferences and options can be accessed from the Windows Screen Saver Settings window. Users can select a number of images or pictures for the application to use as backgrounds for its animated transformations. Several images from multiple folders can be defined as a gallery. One can also select a different directory containing audio or music files. Using the program's built-in audio player, these files will provide the audio ambiance for the screen saver's display. Liquib Screensaver aims to turn the user's image galleries into fluid displays that produce evolving, flowing transformations reminiscent of a kaleidoscope or intermixing liquids. In order to achieve this, it uses various mathematical transformations made available to the user as customizable tools and effects. These can be accessed and adjusted by accessing dedicated tabs located in the window's right-side panel. Users can customize each effect's frequency of occurrence. By default, effects are applied randomly, but one can take control and cycle through them using pre-defined hot-keys. This screensaver produces mesmerizing effects that are enjoyable to look at and can also provide users with a musical background of their choice. The overall effect is very pleasing and will keep you interested for quite a while.